Fire Pit vs. Fireplace: Which is better for your space? When choosing an outdoor Fire element for your home there are two obvious choices that come to mind. One is the classic Fire pit, perfect addition to warm up those chilly nights and roast a few marshmallows over the fire with the family. 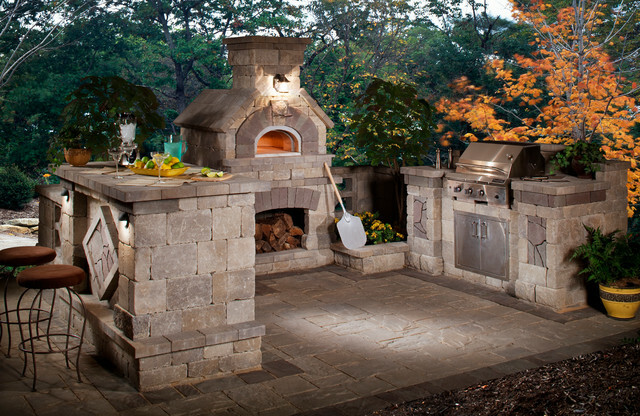 Another feature that’s becoming more and more popular as the years progress is the outdoor fireplace. A beautiful design element, perfect for get togethers and having both friends and loved ones over as well as keeping those colder nights toasty as well. Both have low maintenance and many of the same capabilities. You may be thinking, both sound so great how do you choose between the two? No worries! We are here to help you out and give you an overview of factors to consider when choosing between a Fireplace or a Fire Pit. For starters, envision your future space. Who do you like to spend it with? Is it with friends? Family? Maybe both? Depending on how many people and guests you may want to have at a given time or on average it could affect your decision making on whether you want a Fireplace vs. a Fire Pit. For example, Fireplaces generally have as much seating as you are able to put and extend in front of them, whereas Fire Pits typically have 360 Degree seating all around them. Also, with a fire pit you can add a built-in seating wall, which can give you additional seating and it feels like one cohesive piece with your firepit. However, don’t rule out a fireplace just yet, especially if you mainly only have mainly your immediate family at your home at one time! Fireplaces are still great options for anyone, just maybe consider the alternative if you enjoy hosting large parties each week and are looking for a larger amount of close seating to your fire! Another side note to consider would be that while you can have more seating with fire pits, you also will have majority of the time more smoke coming from them and fireplaces are the exact opposite with less seating and less smoke. So, while you may gain space with a fire pit, you may prefer less smoke and prefer an option like a fireplace in the end. Next you need to envision what you are looking to do in your space. Are you hoping to cook? Are you hoping to have more storage space? Or maybe something that doubles as another feature? Both Fire pits and Fireplaces share many of these qualities. They of course can both have many different materials to light them, such as glass rocks or wood, and can also use gas or a regular flame to roast treats and eats on skewers, but mainly for cooking purposes, there are many more add-on’s for a fire pit. Some including but not limited to: a rotisserie, griddles, or grate, plus many more! Whereas Fireplaces you can again use skewers to cook or even add a pizza oven into the build of the fireplace itself, but that’s about as far as you can go with the add-on’s for a fireplace for cooking. So, we always say if you are into doing more “activities” with your fire element, the Fire pit maybe the way to go. With that said, if you are looking for something with more add-on’s like space for storage of wood for example, Fireplaces can have many different designs where they can incorporate wood boxes while keeping their design and elegant look. Fire pits can be a challenge to incorporate storage space into their designs, but they can often make up for it in doubling as another element. Many custom companies can make covers and tops for fire pits to be able to be used additionally as dinning or coffee tables. Taking the space to another level of functionality and unfortunately, fireplaces typically do not have add-on options like this available. On the other hand, if you care more about design over functionality and you are looking for something that’s going to stand out and elevate the look of your space, fireplaces may be the best option for you. While fire pits and fireplaces are both able to be potential wow factors for a backyard based on their design and materials, Fireplaces tend to be a big statement piece and make a bigger “wow” impression on guests. Due to their elegant feel and vertical designs, they tend to become a main focal point for the space and draw others in. However, elevated design and a wow factor does come at a price. The average fireplace install is around $8,000, while the average fire pit install is around $2,000. 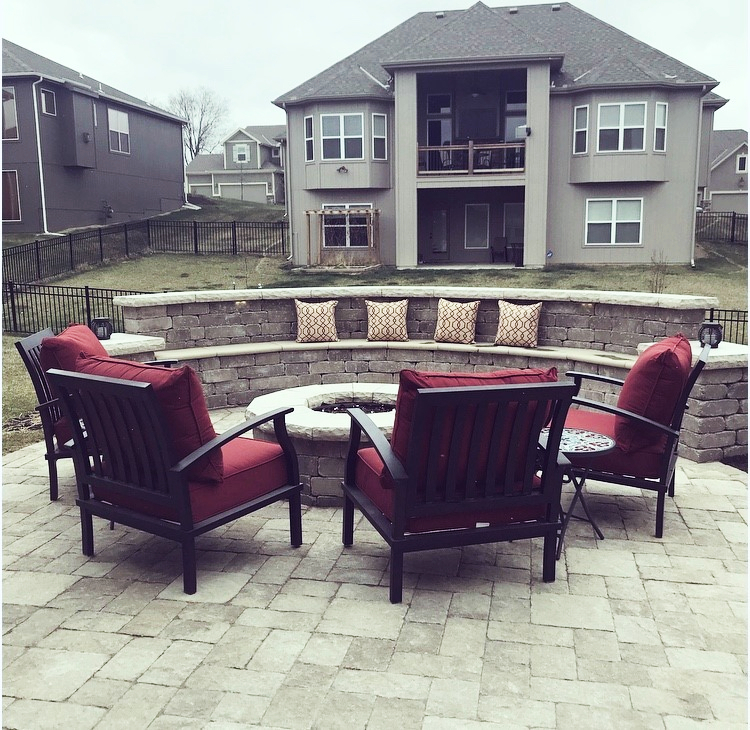 So, if you are on a strict budget and watching your spending on your next backyard project, the fire pit is definitely the more cost effective option between the two. Overall, both are great options for any home and by reading these topics and putting them side by side, depending on your personal preferences and hobbies one may be better than the other for you and your family! We hope that this blog has made that decision easier for you and has lead you closer to knowing which fire element is a better option for your space! In the end, you can’t go wrong with either! Special thanks to the imagery from Belgard! City Permits and Regulations: What to Expect and How you can Prepare for your Hardscape Project!